... and you understand why I am sad and often rumpled. My very stylish friend Jessica was visiting lately, and is planning to revamp her own storage system for her rather extensive collection of pretty things, leading to much deliberation over the Container Store and California Closets' various apparatuses. (apparati?) Once you see pretty wardrobe solutions, people, you can not go back to your sad closet reality. You will spend your days pining for lovely slide-out drawers for accessories, full-wall shoe racks, revolving hangers for scarves, sweater boxes, and the like. 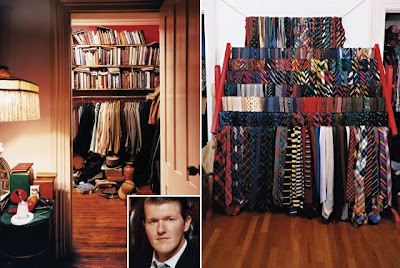 And then Meredith's place (and her boyfriend's amazing collection of ties) showed up this week in New York Magazine, sending me into a fit of jealousy, and also sparking my immediate desire to visit her and bask in their glorious storage spaces. Then, if the universe were not already screaming in my ear "I think you should spend your upcoming student loans on chests of drawers and shelving! ", I stumbled upon Nubby's Helpful Guide To Organizing Your Closet (or Closet-Type Furniture). and the world's most understanding boyfriend.